Essays by Donald Kuspit, Wieland Schmied, Aleksandr Borovsky, Claus Peymann, Elfriede Jelinek, Peter Turrini, Barbara Wally, Christina Wesemann, Peter Weiermair, Knut Boeser, Xenia Hausner. Perhaps, thinking about Xenia Hausner´s pictures and approaching them step by step, we may read them as drafts of unwritten dramas, as blueprints of virtual biographies. The characters she calls into the picture bring with them their experiences, their destinies, their dreams, if broken dreams. But they are not at the end of their story. They come from the middle of a full, sensual life, and all of them have futures ahead, however uncertain. They do not hesitate to uncover themselves, yet give little away. The tragic component of their existence must be guessed at. They may be thick-skinned, but talkative they are not; the bohemian life which attracts Xenia Hausner so much is neither prudish nor sentimental. Drafts of unwritten dramas, blueprints of virtual biographies: in other words, Xenia Hausner´s pictures can be taken to exemplify a type of painting that does not follow literature but precedes it, that can give rise to literature. The act of paiting as an act of love, and at the same time the canvas as the scene of a battle, a confrontation with the other and with the materials and media of painting: these are the two poles between which Xenia Hausner´s art moves. In one painting the element of love may predominate, in another the element of struggle. Fundamentally they are two sides of the same coin. One is unthinkable without the other, even if only one at a time is uppermost and visible. The seond, hidden side remains present and waits to be turned up. Xenia Hausner works “with” the model in more than one sense. Her pictures arise in the course of numerous sittings during which her experience of the other person evolves, partly through the intimacy and the dialog between painter and model. We have said that Xenia Hausner “stages” her pictures, and it is in this respect that photography has a special role to play. The painter views her models in terms of their interaction with each other, and indeed she creates connections between them; the viewer experiences them primarily through their physiognomy, but also through their body language. Hausner designs her characters as if they were on stage, thus producing impressions and experiences of the greatest intensity. The figures appear to be locked in place, yet the frontal perspective means they relate to us, or perhaps to the painter, by means of a revealing body language. Xenia Hausner deploys photography primarily as a way of assembling a repertoire of gestures and attitudes, out of which she then chooses set pieces for the final version of her picture. Sometimes it is merely properties — a couch, a ship’s hüll — that she records for later use. At this point we should look more closely at what we mean by the “psychological portrait” in connection with Xenia Hausner. It refers to neither the rich content nor the vivid psychological characterizations. The protagonists of her portraits are strong characters and, I am convinced, in many ways similar, yet the artist clearly does not pose the question of how to represent the depths that are to be psychologically plumbed. On the contrary, she constructs barriers to such an endeavor, reluctant to complete her narration of the psyche, to “squeeze it out,” exhaust it, when the human being is left entirely open and exposed to view. A further point is the viewer’s danger of contagion from the psychological states, or more generally the states of consciousness that are forcing their way out. Hence the caressing, somnambulistic gaze of the protagonists of her portrait compositions, always focused upon the viewer and demanding contact, a reaction, as response. This, too, has a psychological aspect. When you sit for a portait you are for a long, a very long time – longer than I had thought – subjected to the strange matter of staying still, of representing a body in an environment, a body that will then be stretched flat like a sheet. In this space, within which you represent a three-dimensional object, because you can’t help forming a particular spatial mass, another space unfolds, a space flat as a steppe, but with borders. And on this picture surface you – as an object upon which, in turn, other objects exert their effects – are to become something like a plain where the viewer’s eye can travel when you have long stood up and gone away, when you have long looked entirely different from at the moment when, to become art, you were thrown onto the plain of the picture. And now – I’ve gone, don’t worry – there is an interpermeation of the two spaces, that is, the two people: the one I once was and the one I have become on this stretched sheet. Out of this emerges a new configuration which is called a picture and which in turn generates a new location, or no – rather, a new border. The picture is now what it is. I am not what it is. What do I mean by that? The picture’s canvas does not simply wrap, cloth me, something that canvas sheets could also do, but delimits spaces one from the next, spaces that are very different, some living some dead, and it provides their background too. I’ve been framed and filed, yet have no place on this flat surface, I cannot be sorted. Orderliness, anyway, is alien to my nature. Well, then I’m a border – a border that is gone, but we know where it ran because it’s been put down in paint in this picture. Xenia Hausner paints landscapes. The region she has chosen is the human countenance, the human body. That sounds like an unreasonable claim, yet looking at her pictures has always put me in mind of the fields and meadows beyond the windows of our house in Carinthia. Especially in fall, when the farmers were plowing, everything was uneven, almost coarse. I often sat for hours at the window, and into that torn-open landscape I would fantasize the outlines of faces. Now, looking at Xenia Hausner’s pictures, the converse is true. Into her painted faces I fantasize my landscapes – coarse, open, defenseless landscapes. 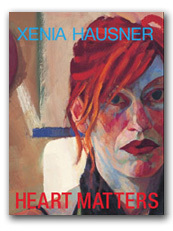 In an unexpected and innovative way, Xenia Hausner´s pictures pass on the myth of the human being, and this myth, always a very concrete one, is retold without mystical or mythical murmurings – just as, according to Lévi-Strauss, Sigmund Freud did not “interpret” the old myths but retold them for his own time, in his own scientific language. Xenia Hausner´s pictures of people are moments of insight into the lacunae of a life story. What has been repressed and denied steps triumphantly onto center stage – true, complex, sensual life, free of pretense. The painting is finished. Stretch arms and legs. I look at the picture. The painter looks at me. What do I think? That´s what she wants to know. Naturally. But what shall I say? The picture is there. Drink a grappa. Take a stroll. I will get used to myself. The picture of me will survive me.